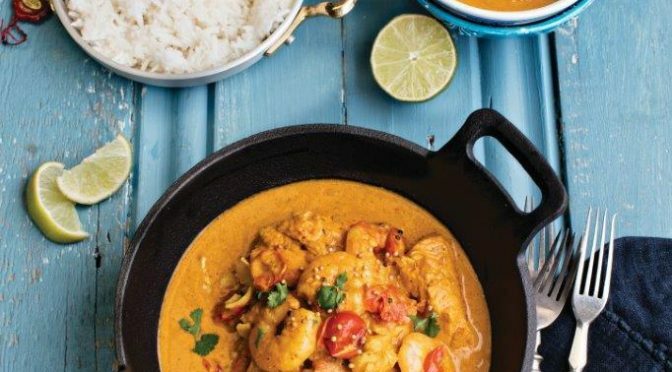 As the days turn more autumnal what could be better for supper than this spicy Thai inspired fish curry from Anna Stewart. Anna has been running the Jarrow Cafe in Castlecomer Discovery Park with her husband Evan since 2007 and kindly shared this recipe with us for the Goatsbridge Trout Charity Fishwives Cookbook. You can find Anna’s original version on page 136 of Fishwives, along with 77 more fish and trout recipes in a cookbook by Goatsbridge, available from select bookstores or online. Heat the coconut oil in a large pan and add the mustard seeds. When they start to pop add the sliced onions and a pinch of salt. Turn the heat to medium and cook gently for about ten minutes, stirring occasionally. They should be soft and golden but not brown. Add the garlic and ginger and stir for one minute. Add the ground spices and heat for another minute. Add the chopped tomatoes to the pan and turn the heat up high. Once the mixture is boiling, turn the heat down to medium and cook gently for ten minutes. Stir occasionally while breaking up the tomatoes with a spoon. Next, add the coconut milk, honey and balsamic vinegar and simmer for five minutes. Check seasoning and add salt and pepper to taste. When you are ready to eat, add your diced fish and cook for five minutes. If you are using a selection of fish, add the densest fish first, like trout or monkfish, followed by other white fish. Add the shellfish and use the lemon half and add a couple of squeezes of juice at the end. It is important not to stir the curry too much at this stage or the fish will break up. Serve with boiled basmati rice and garnish with the coriander.